Forbes magazine has published a splendid article about the history of Dropbox that is one of the most successful startups in the world of IT-industry in recent years. Drew Houston has gotten the startup idea on the bus from Boston to New York. The journey was four hours, Drew took a laptop, but he forgot the flash drive, so he did not have any files to work in his notebook. Drew started to write a code to synchronize files over the Internet on the bus. Four months later, he flew to San Francisco to present his technology in the startups incubator of Paul Graham (Y Combinator), but he refused to accept the project until Houston finds a co-founder. Only after that they gave 15 thousand dollars for development of the project. This money was enough just to rent an apartment and to buy a mackintosh. One of the bright moments in the history of Dropbox is a meeting with Steve Jobs in December 2009, when Apple's CEO tried to persuade the young startup founders to sell the project. Steve Jobs said that Apple will come on this market soon, and Dropbox is a feature, not a product. It is a dream of many startup founders to be sold to a big company for millions of dollars. It is very difficult to resist for the founders of any business to such a proposal. Probably, 99 out of 100 business people would agree to a deal that will make them rich in a success stories. However, Arash Ferdowsi and Drew Houston found the strength to refuse. Here is how the meeting took place in the office of Steve Jobs. "When Houston pulled out his laptop to make his presentation, Steve Jobs who was wearing his crowning jeans and black turtleneck quietly stopped him by a palm movement of his hand:" I know what you are doing guys". At that time, Jobs prophetically foresaw that a young startup Dropbox can be a key asset for Apple. However, Houston strongly rejected such a possibility: he said that he decided to build a big company, and he does not intend to sell it despite the status of the buyer or nine-digit sum of money (Houston considered Steve Jobs as his hero). Jobs smiled warmly and said that he will come on their market with its own product". On the one hand, refusing then the founders of Dropbox did not regret it, because now their business is valued far more than $ 100 million dollars. Just yesterday, the company announced the closing of the next investment tranche of $ 250 million dollars. 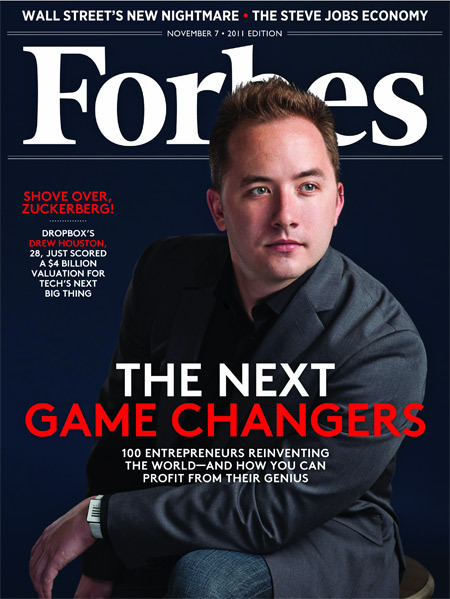 The total valuation of the company is likely to be about $ 4 billion dollars (at least, this figure is shown on the cover of the latest issue of Forbes next to Drew Houston's photo). On the other hand, Dropbox prospects look hazy. Apple just has launched a free hosting with synchronization iCloud, it is not far off launching of Google Drive and similar services from other major companies (maybe Microsoft). Moreover, these giants practically have unlimited resources, and it will be hard to compete with them for Dropbox.